The community of Bonita Bay is a 2,400-acre master-planned community in the heart of Southwest Florida. Situated in Bonita Springs which is also known as “gateway to the gulf”, the community of Bonita Bay incorporates a range of delicate ecosystems and nature preserves, from marshes to mangrove stands, hardwood hammocks, the pristine Imperial River and Estero Bay all of which connect and lead to the Gulf of Mexico. Lifestyle- Bonita Bay is Southwest Florida’s renown, one of a kind lifestyle based community which includes golf, tennis, fitness, swimming, fine dining, private beach and marina access. There is really no other country club community in South Florida which offers more recreational amenities than Bonita Bay. Golf - Bonita Bay offers five championship Arthur Hills and Tom Fazio designed golf courses, offering a range of challenges for players at every level. Each of Bonita Bay’s equity 5 par courses have 18 holes. Additional golf features at Bonita Bay include, three practice facilities, two fully stocked pro shops, PGA instructors and an experienced and accommodating staff add to the a competitive edge and enjoyment of the game. Ninety holes of championship golf make Bonita Bay a golfer's dream come true. Tennis - The Bonita Bay Club tennis program is the areas most active and competitive and is headed by a United States Professional Tennis Association master professional. The Bonita Bay Tennis complex offers 18 clay courts which were recently renovated. Fitness - A staff of licensed athletic trainers and fitness specialists motivate the Bonita Bay Club members in its 10,000-square-foot fitness center, which was re-vamped in 2010. The adjoining swimming pool is another option for fitness classes, individual workouts or a recreational swim. Dining - Only the Bonita Bay Club would offer two dynamic clubhouses, each providing exceptional cuisine, from casual lunches to elegant dinners which include exceptional wine lists to complement the dining experience, and a professional dining room staff. Nature - Bonita Bay Club is locally, regionally and nationally recognized for its tradition of environmental stewardship and award-winning landscaping. Intertwined amongst the foliage and mature landscaping are miles of walking paths. 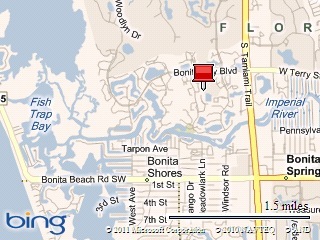 Read also: Bonita Bay Jogging & Walking Trails. Throughout the community it is not uncommon to see wildlife such as, otter, bobcat, deer, manatee, exotic water fowl, unique reptiles and more. Gulf Access Boating - The Marina Club at Bonita Bay offers both wet and dry storage for over 400 boats, waterfront dining at Backwater Jack’s, social and educational activities, and direct gulf access via the Imperial River through Estero Bay. The Marina offers a bait shop, fuel pumps, marine service, dressing facilities and a fully stocked ships store plus sightseeing and fishing charters can be scheduled. Beach Club - Bonita Bay Club offers several nature preserves and community parks, including The Beach Park. The Beach Park is located on the Gulf of Mexico and offers residents the perfect place to enjoy sun, sand and surf. Located approximately 10-15 minutes from Bonita Bay, the park features a private beach, gazebos, picnic tables, grills, showers, rest rooms and a convenient shuttle service during winter months. Parks and Playgrounds - Estero Bay Park at Bonita Bay offers walking paths, screened cabana, children’s playground, butterfly garden and 800 foot boardwalk and walking pier thru the mangrove preserves and out into Estero Bay. Community Boat Ramp - Riverwalk Park at Bonita Bay is a naturally landscaped park overlooking the Imperial River. Riverwalk Park offers a variety of recreational activities including multiple picnic sites, a children’s playground, two lighted tennis courts, a 12 - station fitness trail plus a basketball court. Bonita Bay residents and their guests may also use the park’s boat ramp (with gulf access) and day boat slips for overnight or weekend docking. Destination Location - Located midway between Naples and Fort Myers, is bordered by Spring Creek, the Imperial River and Estero Bay. More than 1,400 of its 2,400 acres are exclusively devoted to open space, including lakes, nature preserves and the network of biking and walking paths. Within approximately 30 minute drive a resident could be boarding a plane at Southwest Florida International Airport, dining in Downtown Naples shopping district or enjoying theater at the Naples Philharmonic Center. Local dining in close proximity to Bonita Bay includes, Roy’s Restaurant, Ruth’s Chris Steakhouse, Carrabba’s, Outback Steakhouse and local favorites such as Rodes Seafood Restaurant, Thai Star and Big Hickory Grille and Marina. Real Estate - The real estate offerings in Bonita Bay include condominiums, carriage homes, coach homes, single family homes, estate homes, villa homes and tower residences. 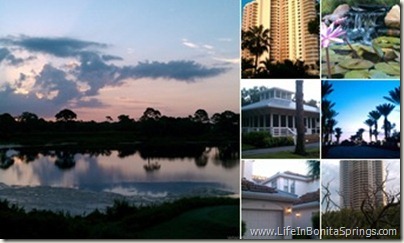 A subdivision list of communities located within Bonita Bay is listed below. Real estate in Bonita Bay is priced from just under two hundred thousand dollars to over several million dollars.